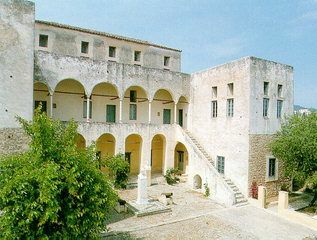 The museum is located in the Mansion of Chatzigianni-Mexi which was built in U shape between 1795 and 1798. Only the first floor is opened to visitors, however the mansion has also a groung and a second floor. Its exhibits cover more than 4000 years of history of the island covering all forms of art, such as: Amphorae from the pre- Hellenic and Classic period, sculptures and coins from the Roman and Byzantine period, post-Byzantine icons and other religious items, costumes and other objects of everyday use. Visitors may also admire the Flag and paintings of of the 1821 Greek Revolution against Turks, Bouboulina’s remains, arms and portraits local admirals, their ornaments, testimonies of the role of Spetses held in the Revolution etc. The museum is situated on the the back road of Spetses town.